The Attends Contours have been designed for heavy incontinence of patients and seniors who lack urinary or faecal control.The Attends Contours are designed for long term usage so they don’t have to be changed as often during the day. The pads have built-in quick dry fibres to help keep the skin dry. There are flexible leakage barriers that surround the interior of the pad that keep fluids inside, rather than escaping onto clothing or furniture. Since there is a barrier that keeps skin dry, there won’t be immediate need to change the pad. These are large-shaped pads to help deal with heavier levels of incontinence. The quality is manufactured to the highest standard. This ensures that the pads have effective leakage barriers and a dual core technology to collect the fluids. The pads don’t need to be changed after each urinary release. The pads have a wetness indicator that will alert when they need to be changed. The indicator is blue when out of the package. This wetness indicator will disappear where the pad has absorbed its maximum fluid. This means it’s time that the pad needs to be changed. It’s quick to check the blue indicator and much more convenient than having to remove the pad first. 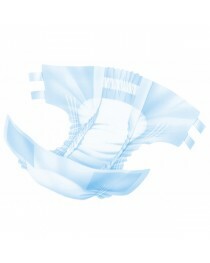 The pads also provide a good barrier for odour control so embarrassment is decreased. They’ll lock in any foul odours. They have a breathable textile backing that makes them more comfortable when resting against skin. These combined materials allow for the best leakage protection, while the quick dry fibres provide reliability and comfort. These combined features also extend the lifetime of the pad, and also remove the need to change it often. The best way to wear the pads is over underwear and stretch pants. The flexible leakage barriers provide comfort that adapts to movement. They’re comfortable whether standing up, sitting, or lying down. They will stay in place during exercise and walking. The Attends Contours are sold in packs of 35 for cost-effectiveness. Each has a front width of 18 cm and a length of 58cm / 22”. Each holds a volume of 1499ml of fluids. 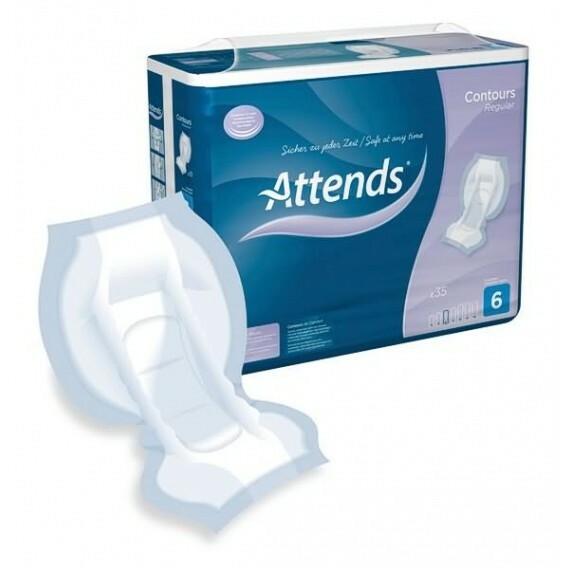 These are Attends Soft 5 level in comfort and absorbency. They’re best suited for moderate incontinence but will work up to heavier levels. • Pale blue wetness indicator for changing.